One of the challenges that I see with the Vegan diet is getting enough, and the right types of, protein…or more properly getting it efficiently. Woven throughout their book is that some foods just aren’t worth it…their nutrient value is too low compared to the caloric value, or simply that there are better choices…and use that as the basis for limiting most dairy and grains…and for promoting lean meats and fish as your primary protein source. Our athlete had better like beans and have a huge appetite! The above requires eating an additional 2,300 calories that day…eating grains and legumes to get daily protein is not only very inefficient, but, far worse, the (vegan) athlete will come up short on essential amino acids…even if he can stomach all those beans and grains. …it does however, go to one of my key ‘concerns’ about eliminating lean meats and fish entirely from my diet…you would need to be _extremely_ balanced and careful to get in enough fat and protein in every meal…every day…to get in the proper balance of fat/carb/protein on a Vegan diet, without going way over the top on calories to try to ‘catch up’ at the end of the day if you’re short somewhere. 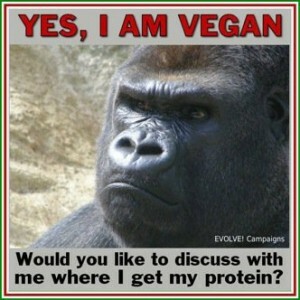 This entry was posted in Dad's Blog Posts, Nutrition, Vegan, Veganism and tagged protein in a vegan diet. Bookmark the permalink. Even on the best weeks, I don’t think I have ever tracked the nutritional makeup of my diet – which will probably be my BIGGEST challenge this week (apart from limiting my grain intake!). Guaranteed that I probably don’t get the recommended protein intake even by the Thrive diet standards.. but here’s an article Brendan Brazier wrote specific to protein and a plant-based diet: http://www.penguin.ca/static/cs/cn/0/microsites/thrivediet/pdf/protein.pdf. I think the tracking will be the most interesting part of this process for me.. and hopefully once I go back to my mostly-Vegan diet.. I can take some of those lessons with me! Thrive uses Quinoa in everything – I usually eat it in lieu of rice (and make it in the rice cooker).. but there’s also a great Quinoa pizza dough recipe if you’re ambitious!